Story Theatre is the dramatic presentation of one or more stories told by a group of actors play who multiple roles and provide narration. It is characterized by the use of simple “scenery” like chairs and tables arranged to suggest various settings, simple props like scarves or cardboard tubes used in different ways in more than one story, and costume pieces like aprons, glasses, or a hat. Music is also often incorporated into Story Theatre performances. In the theatre, a convention is a practice accepted among people who stage plays. Below are a number of techniques, or conventions, used in Story Theatre. There are usually just a few basic props. The same props may be used in different ways in more than one story. A big piece of fabric, for example, might be a cape in one story, a rug in the next, a river in the next, and a snake in the next. Other examples of props that performers transform by the ways they handle and react to them: wooden dowels, floating pool “noodles,” scarves, planks, ropes, bowls, and balls. Lines may be assigned to individual speakers, pairs, small groups, or the entire cast. Narration plays a big part in Story Theatre productions, but there is no designated Narrator. Instead, characters narrate their actions and speak their lines of dialogue. One actor may play multiple roles. Females may play male characters, and males may play females. Performers may play animals. Simple changes in voice, posture, movements, and costume props signal to the audience that an actor who played, for example, the Farmer in one story is now the Princess in a new story. Story Theatre “scenery” is simple: wooden boxes, chairs, benches, tables, or ladders. Throughout the performance, these pieces are moved quickly to indicate a number of different settings. While the audience watches, the actors rearrange the set pieces to make: a train, a cave, a hill, a boat, a horse, a bridge, or a throne, etc. The basic costumes are generally neutral in color and style. The actors indicate a change of character by adding a costume piece such as a hat, a cape, a coat, an apron, a wig, nose and glasses, gloves, a shawl, a vest, a bandanna, a crown, or a fur coat. Performers frequently use pantomime to dramatize the stories—even when the pantomimed object is visible. For example, one performer may pantomime cracking a whip while another performer, off to the side, actually cracks a real whip or makes a slapping sound to produce the sound effect. Cows mooing, thunder, lightning, rain, wind, night sounds, crickets, creaking doors, a horse’s whinny and clopping hooves, ocean waves, seagulls, knocks on a door, a creaking gate, or a strong wind. This form of theatre usually requires high-energy, exaggerated performances. The entire company of actors often remains onstage throughout the performance, playing roles, singing songs, moving set pieces, making sound effects, and reacting to the events of the dramatized stories as they happen. 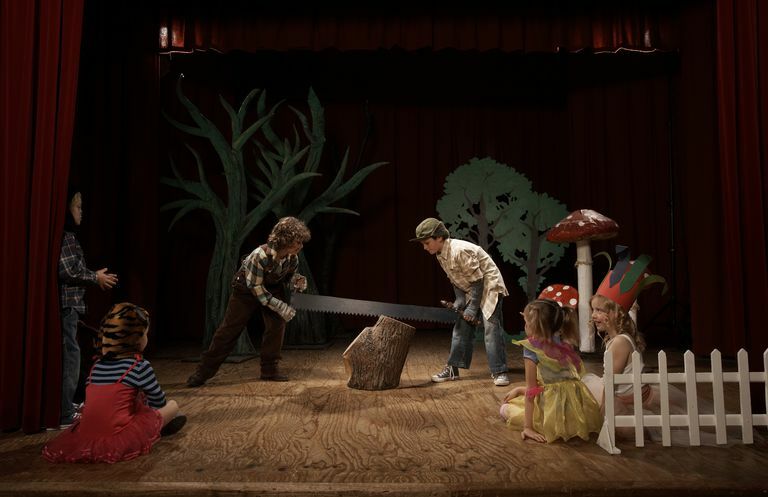 Because of the many characters in a collection of stories, Story Theatre productions can accommodate large casts of actors or small casts who, as stated previously, play multiple roles. 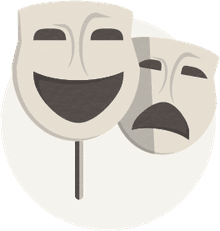 Theatre teachers and classroom teachers can also use Story Theatre conventions as a way to have students transform the texts that they read into dramatizations. To watch a portion of a Story Theatre Production, click here. To visit a web site dedicated to the work of Paul Sills and Viola Spolin, click here. What Is Resolution in Literature?